Protests in Algiers and Paris continued against a fifth presidential bid by Algeria's octogenarian Abdulaziz Bouteflika, ahead of a Sunday deadline for candidates to put in their names. Two cities. Two protests. Each with very different atmospheres, but both for the same cause: to call on Bouteflika to step down. 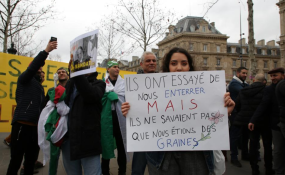 In central Paris, at the Place de la Republique; thousands of Algerians living in France are united by their disdain for Bouteflika's plans to run for a fifth presidential mandate. There is music and singing. People of all generations and walks of life rub shoulders as the crowd swells. One of the organisers of today's protest in Paris, Salah Hadjab, came to live in France 16 years ago. He is flanked by his two young sons who were born in France but travel regularly to Algeria. "Algerians in France are tired of living in exile. We want to be able to live and work in Algeria. We can't because of the Bouteflika mafia," laments Hadjab. Chanting "Bouteflika go away", dozens of students rallied in the city centre of Algiers cordoned off by police, AFP journalists said, as similar protests were reported across the country. Adding to concerns about his fitness for office, the president flew to Switzerland a week ago for what his office described as "routine medical checks". On Saturday, he sacked his veteran campaign manager Abdelmalek Sellal, a former prime minister who successfully oversaw Bouteflika's past three re-election bids, state media said, without giving a reason. Police deployed massively around the council's headquarters in Algiers on Sunday and the road leading to it was blocked, while journalists seeking to cover the arrival of candidates were locked in a room. An analyst who declined to be identified said Sellal's sacking could be a tactic to calm the growing protest movement against Bouteflika's bid for a fifth term. An editorial Sunday in El-Mouhajid newspaper, a mouthpiece of the government, suggested that Bouteflika would not pull out of the race under pressure from the street, saying protesters will be "disappointed". The first rally against Bouteflika's bid for re-election drew tens of thousands on February 22 with protesters chanting mostly "No fifth mandate". During the protests in Algiers clashes erupted between police and protesters when some of them tried to march on the Government Palace which houses the prime minister's office. Bouteflika, who has been in power for two decades, gained respect from many for his role in ending a civil war in the 1990s which, according to official figures, killed nearly 200,000 people.